Submit your business to local directories to get more website visitors, but also to improve your website rank in google, bing and yahoo. You can add your company profile to important online directories including Google+, Yahoo Local, Bing Local, Manta, Superpages, and many more. You may also find a directory for your own city, or town that can give valuable exposure. 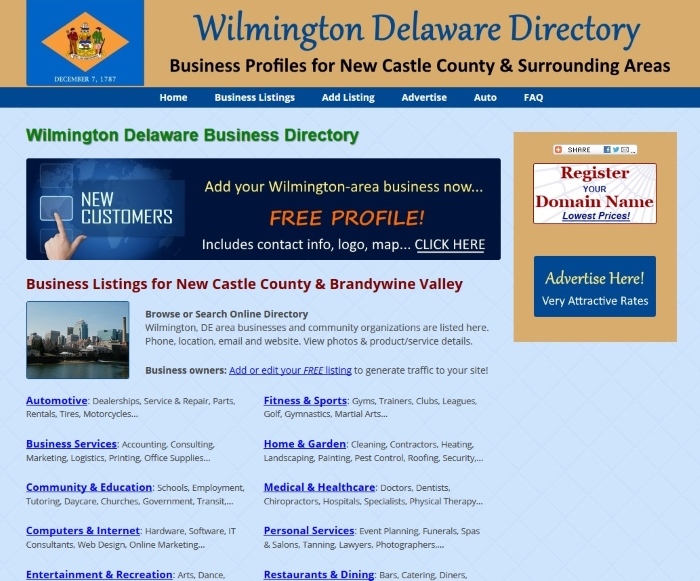 For example, in New Castle County, DE, submit to my upgraded Wilmington Delaware Directory for free! Your business listing can include address, contact info, link to website, description and even a map to your location. The extra inbound link will improve your google rank. You may update information at any time. Low cost advertising is also available, so you can take advantage of visitors searching in your target market. 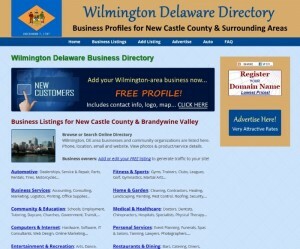 The directory is a source of information for the City of Wilmington, Delaware and surrounding counties. Find restaurants, schools, churches, stores, homes, associations, contractors, and other yellow pages type of listings for New Castle County, Cecil County Maryland, and Chester & Delaware Counties of Pennsylvania. This is an online business directory where all company profiles have been added by the owner. If you know of a business, non-profit organization, club or other entity, suggest this site so they can receive free publicity! Included are firms in Newark DE, Hockessin, New Castle, Claymont, Pike Creek, Elsmere, Christiana, Bear, Middletown, Kennett Square, West Chester, & Dover DE & Elkton MD. It takes only a few minutes to add your listing. And don’t forget to attach your logo! This entry was posted in Internet Marketing, SEO and tagged business directory, delaware directory, delaware seo, directory listing, google rank, wilmington delaware on March 8, 2016 by recast.